Schematic representation of the complement cascade. C1q,r,s cross-linking of antibodies activates the classical pathway. Mannose-associated serine proteases (MASPs) bind to mannose motifs expressed on bacteria to activate complement via the MBL pathway. Subsequent cleavage and assembly of C4 and then C2 form the C4bC2b C3 convertase. C3 spontaneously binds to H2O, forming C3(H2O), which binds to cell surfaces and initiates factor B–dependent (fB-dependent) and fD-dependent assembly of the alternative pathway C3 convertase (C3bBb). 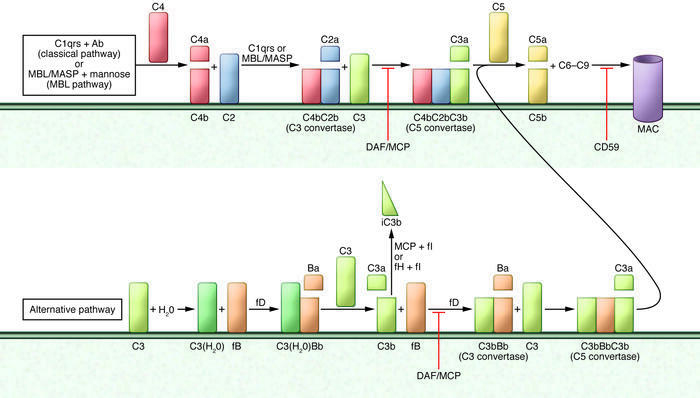 The latter cleaves C3 into C3a and C3b, amplifying complement activation. Addition of a second C3b molecule to either C3 convertase forms the C5 convertase, which cleaves C5 into C5a and C5b. C5b, in conjunction with C6 to C9, comprises the MAC. C3b functions as an opsonin, whereas C3a and C5a have inflammatory and chemotactic properties. DAF (CD55) and MCP (CD46) are cell surface–expressed complement regulators that accelerate the decay of all surface-assembled C3 convertases, thereby limiting amplification of the downstream cascade. MCP and fH also have cofactor activity: in conjunction with soluble fI, they irreversibly cleave C3b to iC3b, thereby preventing re-formation of the C3 convertase. CD59 inhibits formation of the MAC.